Minister of Youth, Sports and Culture the Hon. Charles Maynard poses with Bahamian heavyweight boxer Sherman “The Tank” Williams and stakeholders at a courtesy call announcing his November 5, 2010, fight with Evander Holyfield in Detroit, Michigan. Pictured (from left) are promoter Dave Johnson, Mr. Williams manager Si Stern, Bahamas Boxing Commission Chairman Pat Strachan, Mr. Williams, Minister Maynard, “The Tank’s” wife Kimberly Williams, Acting Director of Sports at the Ministry Kevin Colebrooke, Secretary of the Bahamas Boxing Commission Fred Sturrup, “The Tank’s” friend Romell Knowles and Director of Sports Tourism Development at the Ministry of Tourism Tyrone Sawyer. 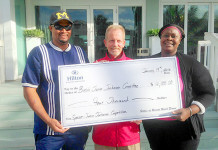 Nassau, The Bahamas – Minister of Youth, Sports and Culture the Hon. 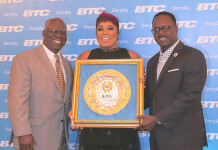 Charles Maynard recently expressed the “delight” of his Ministry at the announcement of Bahamian Sherman “The Tank” William’s upcoming boxing match with former World Heavyweight Champion Evander Holyfield. “This is another milestone in the annals of Bahamian boxing,” Minister Maynard said at a press conference at the Ministry. Minister Maynard added that the match will take place November 5, 2010, at the Joe Louis Arena, Detroit, Michigan, and is a part of a “comeback attempt” by Mr. Holyfield who last fought in April of this year. “Mr. Holyfield is a four-time heavyweight champion, so he is a worthy opponent,” Minister Maynard said. “Mr. Sherman ‘Tank’ Williams is also a heavyweight champion who deserves respect. Mr. Williams, in the past, has won the WBC Caribbean Boxing Federation (CABOFE) and WBA World Boxing Association (FEDECARIBE) Caribbean titles. He is also the former National Boxing Association champion. Mr. Williams, a Grand Bahama native, first thanked God for the opportunity he has and said that it was good to “come home on a happy note”. After relating a bit of his history as a young Bahamian and coming up the ranks as a fighter, Mr. Williams said that he thought Mr. Holyfield had always been a respectful champion and thought that he was an “awesome” fighter during his trilogy of bouts with Riddick Bowe. “Now that we are here in 2010, it is my time to fight the legend Evander Holyfield and I have a great sense of pride and nationalism to realise that, for this one night at the Joe Louis Arena in Detroit, Michigan, it will not just be ‘Tank’ Williams against Holyfield. I will have the whole country behind me. “For all his fights, Mr. Holyfield has never been in a ring with a Bahamian,” Mr. Williams added. “We, here, at the Ministry of Youth, Sports and Culture are desirous of seeing ‘The Tank’ add Mr. Holyfield to his list of ‘victims’ of his long and illustrious sojourn in the ring,” Minister Maynard quipped.